Michigan State University is in the planning phase of a capital campaign that will officially begin with a spectacular kickoff on Friday, September 20, 2002. The capital campaign launches an intensified fund-raising effort to provide support for both existing needs and future plans. Recruiting faculty of the highest distinction. Endowed chairs and professorships enable MSU to recruit and retain distinguished scholars and scientists who are also talented teachers able to become catalysts for excellence in every MSU college and academic unit. Creating an exceptional student experience. Endowed scholarships for undergraduates and fellowships for graduate students make it possible for talented and committed students to graduate from MSU without overwhelming debt. Delivering valuable outreach and public service programs. Endowed support for the Education Policy Center allows the college to deliver relevant, research based nonpartisan information to educational policymakers in Michigan. The College of Education Campaign Advisory Committee is made up of leaders in the college and several of our alumni. We wish to thank those who have given of their time to be part of the advisory committee: Gerri Elliott, Mary Lee Gardner Gwizdala, Lou Romano, and Paul Williams. We are ready to meet the challenge. We hope you will join us. Although a considerable focus will be on the future of the college through endowment funding, we remain mindful of our current needs. We will continue to seek support for student scholarships, especially to assist teacher education students during their internship year through the Dean’s Excellence Fund and to recruit underrepresented groups through the Beaumont Tower Minority Recruitment Fund. 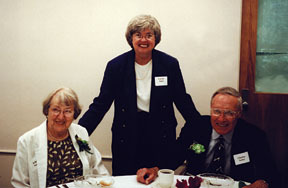 Edna and Charles Seeley enjoy a moment with Dean Carole Ames during their visit as part of the Patriarchs Reunion. In June, Dean Carole Ames welcomed back graduates of the Class of 1951. At a brunch in Erickson Hall preceding the kickoff of the All-University Patriarchs Reunion, participants shared life stories and recalled their experiences at what is now MSU. Although their experiences after MSU varied widely, their recollections of college life were similar. Many fondly recalled the Quonset huts located where the Breslin Center now stands, classes in trailers, and the very different but beautiful campus.